The commanding general of the XVIII Airborne Corps will take the lead in the U.S. fight against the Islamic State group later this summer, Defense Secretary Ash Carter announced during his recent trip to Iraq. Lt. Gen. Stephen Townsend will succeed Lt. Gen. Sean MacFarland, commander of III Corps, who has led what Carter called "this vitally important campaign" since September. During those same remarks Monday in Baghdad, Carter announced the U.S. would be deploying an additional 560 troops to support Iraqi Security Forces at the Qayyarah West airfield, also known to U.S. troops who previously served in Iraq as Q-West. The troops will "bolster the Iraqi efforts to isolate and pressure Mosul," Carter said. They also will help the Iraqis establish a "logistical springboard for their offensive on Mosul," he said. Footage of an Air Force strike on Islamic State fighters near Habbaniyah, Iraq, on June 29, 2016. Assets included F-15Es, A-10s, B-52s, and MQ-1s. "At every step in this campaign, we have generated and seized additional opportunities to hasten ISIL's lasting defeat," Carter said, referring to the Islamic State group by an alternate name. "And with these additional U.S. forces, we'll bring unique capabilities to the campaign and provide critical support to Iraqi forces at a key moment in the fight." Townsend and MacFarland are expected to change command in August. Carter praised MacFarland for his "outstanding leadership." "Our nation owes you a great deal of gratitude for successfully leading — yet again — a challenging campaign in a challenging part of the world," Carter said. "Come August, you will be handing over this fight to another remarkable officer and leader, Lt. Gen. Steve Townsend. But as complex as this fight remains, I know Steve will inherit a campaign that has progressed remarkably under your leadership." Staff Sgt. 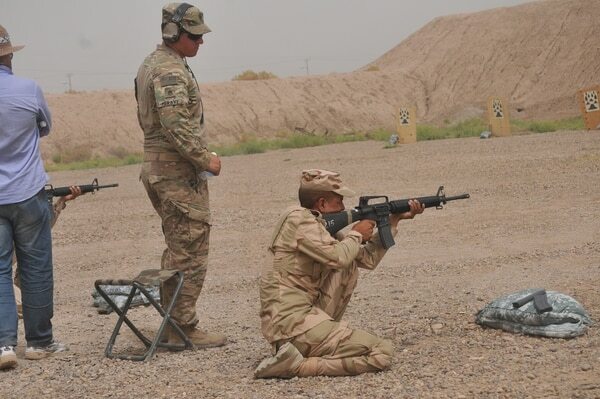 William Meravy, left, a trainer with Company A, 1st Battalion 502nd Infantry Regiment, watches as an Iraqi army ranger student engages targets in the kneeling position at Camp Taji, Iraq. Camp Taji is one of four Combined Joint Task Force – Operation Inherent Resolve building partner capacity locations dedicated to training Iraqi security forces. MacFarland and about 450 soldiers from the III Corps headquarters will return to Fort Hood, Texas, later this summer after a 12-month deployment. Townsend and about 450 of his soldiers from the XVIII Airborne Corps headquarters at Fort Bragg, North Carolina, will replace them in Kuwait. There they will run the headquarters of Combined Joint Task Force Operation Inherent Resolve. 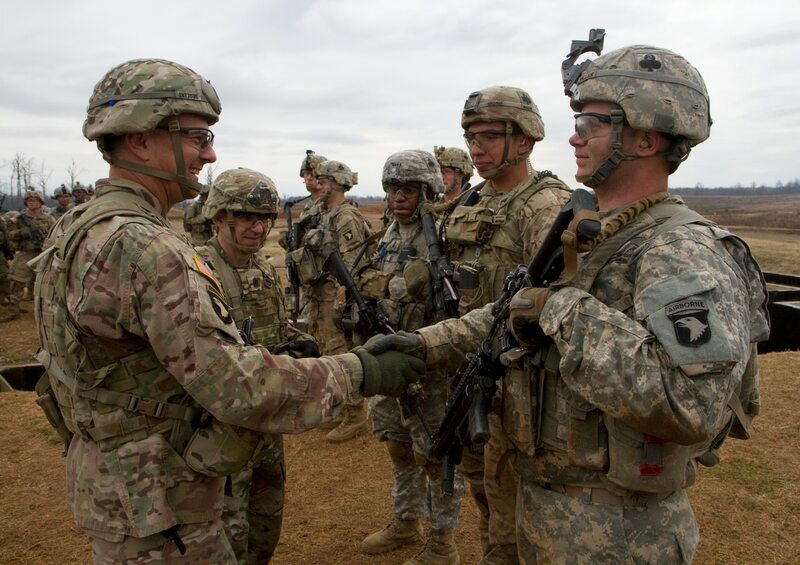 Townsend, who took command of the XVIII Airborne Corps in May 2015, has served with the 82nd Airborne Division, the 7th Infantry Division, the 75th Ranger Regiment and the 101st Airborne Division. He commanded the 10th Mountain Division and has served many times in Afghanistan, including during Operation Anaconda. The veteran of Operations Urgent Fury in Grenada and Just Cause in Panama also commanded a Stryker brigade in combat in Iraq. The Army in March announced the XVIII Airborne Corps headquarters' upcoming deployment. "The corps has a long and proud history of answering the calls of our nation," Townsend said in a statement at the time. "The soldiers of the XVIII Airborne Corps are well-trained and stand ready to support this important mission."